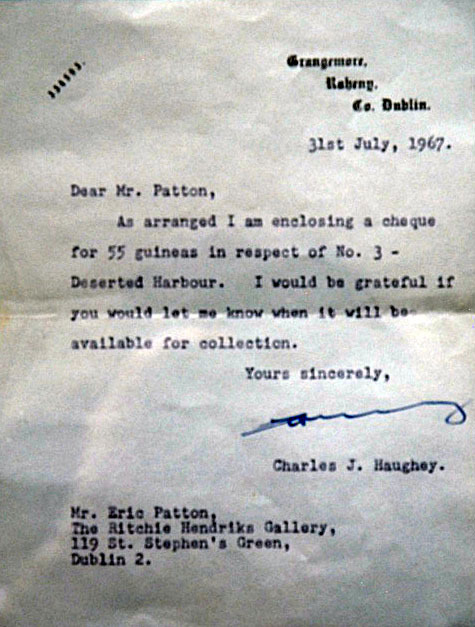 Charles Haughey was Minister for Finance at the time he wrote this letter to Eric Patton, from the Richie Hendriks Gallery. While the gallery, which was here on Stephen’s Green, was cutting-edge, the painting in question recently sold for just €800. In the same year, Haughey sold his old house in Raheny for £200,000, having bought it for £50,000 ten years earlier. The land had been rezoned in the interim. Opening an office building on St Stephen’s Green that year, he announced, “I, for one, have never believed that all architectural taste and building excellence ceased automatically with the passing of the 18th Century.” That same year, 1967, Haughey bought Abbeville, an eighteenth century mansion designed by Gandon.